Voltronics Corp - RFMW UK, Ltd.
Voltronics Corporation was founded in 1969 and is one of the world’s leading supplier of multi-turn trimmer capacitors. Voltronics is now part of knowles Capacitor group alongside Dielectric Labs Inc, Syfer and Novacap. The placement of these companies within Knowles Capacitors has many synergies and for example allows Voltronic to be the focal point to promote non-magnetic components within the group. Non magnetic trimmer capacitors for (e.g. 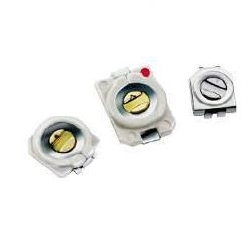 MRI scanners) has been the main stay of Voltronic’s business for many years and is based on their technical advantage which is the ability to make a multi-turn trimmer using a non rotating piston which is sealed into the housing. This creates a very stable and very high precision trimmer capacitor for many applications. Voltronics offer a full range of non magnetic components including the range of trimmers and a full range of MLC parts also.They also make full custom parts for many of their customers. Voltronics has more recently introduced a range of half turn trimmers for less stringent applications. They still exhibit good stability and power handling characteristics.